Attention TV shoppers: Acorn TV’s Girlfriends in no way is a reboot of what just happened to be the same-named sitcom that lasted eight seasons on UPN and then The CW. The three protagonists of this British production are far closer in age and temperament to The Golden Girls. But the comedic moments in this six-part series are secondary to the mystery of how a besotted husband tumbled to his death off a cruise ship balcony. The issue of age discrimination is also paramount, but creator/producer/writer/director Kay Mellor (Love, Lies & Records) avoids overtly preaching in the four episodes made available for review. Girlfriends, which begins streaming in weekly one-hour doses on Monday, Jan. 29th, doesn’t always hit its marks -- particularly during the over-reaching opening minutes of Episode 4. But the three lead performances, particularly on the part of Miranda Richardson, are more than enough to carry the day. Richardson plays Sue, a nose in the air, creature-comforted bridal magazine features editor who’s suddenly sacked by her longtime boyfriend and boss, John (Anthony Head). They founded Adorable together, but now he sees her as too old and outdated for the job at hand. A meaningless consultant’s position is offered. No thanks. Emphatically, no thanks. A variety of supporting characters are woven through Girlfriends. Each of the three principals has grown children in various stages of repair or disrepair. But it’s Sue’s disaffected gay son, Andrew (Philip Cumbus), who mostly comes to the fore as an attorney who ends up representing both his mother and Linda. Beyond Sue (“I need a large g &t and a cigarette”), most of the comic relief comes from Gail’s tart, 84-year-old mother, Edna (Valerie Lilley), who’s prone to wandering away from her nursing home but retains at least partial control of her faculties. Her dress-down of Gail’s layabout son Tom (Matthew Lewis) in a later episode provides one of the series’ more delectable moments. There’s also poignancy when Gail and Edna have a heart-to-heart on the bus ride back from a new and more vigilant rest home of which “mum” wants no part. Girlfriends is also about making amends for past transgressions. Sue is particularly guilty on this front, and in large part owes her self-realizations to John’s latter-day shoddy treatment of her. He remained married during their long, intimate relationship, and now is intent on trading Sue in for a younger model. Their impending legal battle is a secondary story line to the whys and wherefores of Micky’s demise. Each of the four episodes screened for review ends on a mini-cliffhanger. Under Acorn’s current method of distribution, you’ll have to wait a week -- and then another week -- for the latest resolution. In the streaming world, that goes with the flow of Hulu while Netflix and Amazon continue to provide instant binge gratification. Girlfriends, whose six episodes easily could be devoured over a weekend, cries out for a big gulp alternative. But for now, its tantalizing end-of-episode danglings call for some old school calendar circling. Better known lately as the face of those heavily exposed Farmers insurance ads, J. K. Simmons knows a thing or two because he’s seen a thing or two. Not so in Starz’s new Counterpart, where his character knows a lot less than he thinks and hadn’t really seen anything yet until meeting his hard-edged double from a parallel dimension. Lookalike cousins Patty and Cathy Lane from The Patty Duke Show simply had disparate tastes in styles, music and manners. 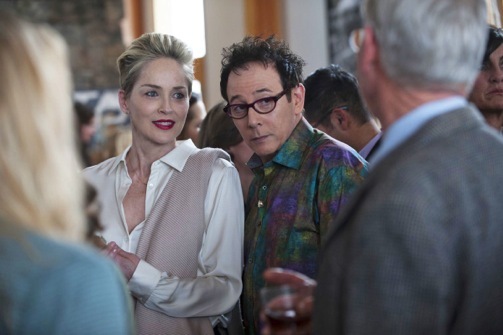 The contrasting Howard Silks of Counterpart, both played by Simmons, are playing for far higher stakes, even if profane, take-charge Howard also thinks that meek, real-world Howard dresses like a dork. It’s much more complicated than that, though. As the old sitcom song goes, you could lose your mind. The first episode of Counterpart was sneak-previewed on Dec. 10th following the Season Three finale of Outlander before having its official premiere on Sunday, Jan. 21st. Due to some technical problems and a crush of other series launches, we’re playing a bit of catchup. But Starz has made the first six of Season 1’s 10 episodes available for review, so it’s good to still be ahead of the game. And what a game it is. At first look, there’s just one Howard Silk. He’s spent three decades as a mid-level, faceless bureaucrat with a Berlin-based United Nations agency called the Office of Interchange. His beloved wife, Emily (Olivia Williams), has been in a coma for six weeks after being hit by a car. Howard dutifully visits her daily, always with a fresh bouquet of flowers and a stem or two for the reception desk. He also yearns to move out of his dead-end job and into “Strategy.” But his officious young boss, Peter Quayle (Harry Lloyd), tells him a promotion would have happened by now if it was ever in the cards. Quayle also lightly reprimands him for an unauthorized interchange during a daily message swap. Howard had the temerity to point at a spot on a fellow employee’s tie. “Sometimes it scares me. I don’t know what we do here,” Howard laments. This turns out to be a vast understatement when a lookalike Howard suddenly emerges from an identical, top secret portal that somehow was created some 30 years ago before an “experiment” went awry and led to something of a cold war between the two Berlins. The second Howard is a curt man of action who’s after an escaped assassin named Nadia Baldwin (convincingly and compellingly played by Sara Serraiocco). One of her targets is original Howard’s comatose wife, about whom more is learned in later episodes. So the two Howards must work together for at least a while because “I need to pretend to be you, take Baldwin out myself,” says second Howard. 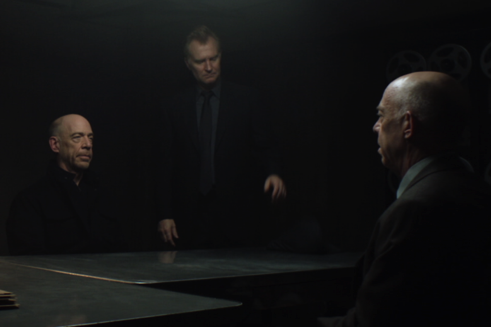 Counterpart blooms and grows as an absorbing sci-fi/spy thriller with elemental questions about how identities can be forged and changed by environments and circumstances. During a one-on-one scene dusted with some light humor, second Howard tells original Howard that “the difference between you and me could be a single moment.” First, though, they talk about their respective cholesterol levels. There are more doubles in play, another of which was revealed at the close of Episode 1. Let’s just say that second Howard was lying when he said that his wife, Emily, had died of cancer. On the contrary, she’s very much alive and possibly not all that much different from original Howard’s lookalike Emily. Not coincidentally, Counterpart initially aids viewers regarding which Howard is which by making a point of noting that original Howard always wears an oft-exposed white t-shirt that second Howard notes with disdain. This helps in grasping the early lay of the land until the two Howards literally cross over in later hours for what’s meant to be a relatively short period. It affords the very capable Simmons (an Oscar-winner for his supporting role in 2015’s Whiplash) an opportunity to put some poignancy into the proceedings. Other characters of note include the duplicitous Alexander Pope (Stephen Rea), who operates in the other world; no-nonsense, real world director of diplomacy Roland Fancher (Richard Schiff doing double time away from ABC’s new The Good Doctor); and operative Ian Shaw (Nicholas Pinnock), who has an intimate relationship with a key character. The serpentine, cloak and dagger goings-on in Counterpart time-share with the very human needs of the protagonists. Not everything meshes entirely smoothly, but the series’ style and substance are apparent from the start. Starz already has ordered a second season of 10 more episodes. So in a sense we’ve only just begun. Things could go off the rails at some point, but it would be quite surprising if they did. The audience for Counterpart on a pay premium network will amount to only a small fraction of the exposure J. K. Simmons is getting with those ubiquitous Farmers insurance spots. They pay his bills. Playing the two Howard Silks, though, is what makes Simmons who he really is -- a bald, plain-faced actor of presence and stature who at age 63 is getting to play leading men on two entirely different fronts. In both cases, he makes the sale. The serial killings are gruesome, the cops are corrupt and the gumshoes are dedicated but always up against it. Whether fact-based or fictional, television networks and streamers are head over heels in love with murders most foul. 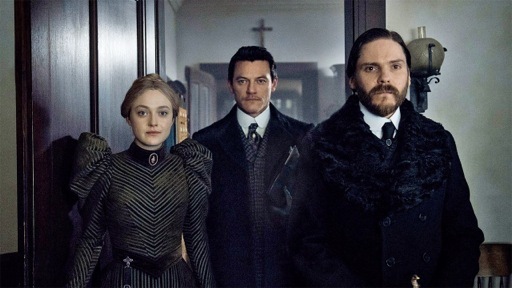 TNT’s heavily promoted The Alienist, drawn from a same-named 1994 novel by Caleb Carr, is somewhat unique in setting but same old/same old in terms of the overall genre. This time we’re in 1896 New York City, where intense alienist Laszlo Kreizler (Daniel Bruhl) strives to put together clues and motivations tied to the murders of young boys dressed as girls for varying reasons. What’s an alienist? Well, it has nothing to do with Martians or E.T. As a printed intro puts it, those with mental illnesses back then were thought to be “alienated from their own true natures.” So alienists were brought in to probe their psyches. Kreizler calls on newspaper illustrator John Moore (Luke Evans) to sketch the latest mutilated corpse. Moore otherwise enjoys the company of female ladies of the night and is easily exasperated by Kreizler’s at times haughty demeanor. “My God, Laszlo, sometimes you can be as subtle as a blowtorch!” he exclaims. So no, they’re not a perfect match, heh-heh. But yes, they tend to serve each other’s purposes. The Alienist depicts turn-of-the-century New York City as an oft-times grimy, primitive cesspool that you wouldn’t want to visit let alone live in. Episode 1’s sequence at the Bellevue asylum is particularly gruesome. A wrongly jailed suspect in the murders is dying of syphilis, his face horribly disfigured by boils and bloodied by banging it against his cell bars. An Emmy nomination for makeup might be a possibility. At the end of the hour, the otherwise orderly Laszlo seems to go a bit mental himself via an oddly disjointed declaration that “I must see life as he (the killer) sees it. Feel pain as he feels it . . . I must follow this wherever it goes, even if leads me to the darkest pit of hell.” Oh stop it. Those who book full passage for Season One’s 10 episodes may or may not get full closure. The Alienist, which closes out Episode 2 with Moore at the mercy of gangland forces and their young boy prostitutes, so far is trying terribly hard to be darkly spellbinding. Toward that end, it has yet to make its case. 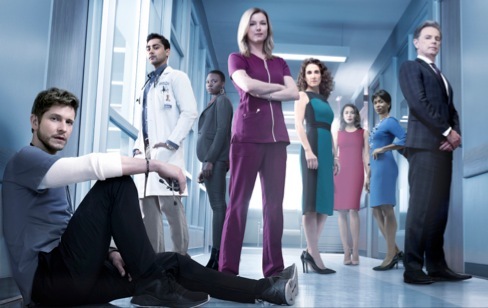 Amy Holden Jones, daughter of a doctor and co-creator/executive producer of Fox’s new The Resident, seems to know just what many TV critics are thinking. Sigh. Yes, I have. But this doesn’t make The Resident guilty of full-blown malpractice. The cast is diverse and pretty appealing. And Fox is enough of a believer to gift The Resident with a high-profile launch following Sunday night’s Minnesota Vikings-Philadelphia Eagles NFC championship game. The Resident otherwise will air on Mondays after Lucifer. Atlanta’s fictional Chastain Park Memorial Hospital also is something of a devil’s workshop, with venerable Bruce Greenwood playing a shaky-handed, vain, blackmailing chief of surgery. Dr. Randolph Bell literally gets away with murder in the opening scene during a routine appendectomy. But those who witness his growing ineptitude are cowed into covering it up because Bell’s threats of reprisals are like lethal injections. He’ll deport you, demote you, see that you never practice medicine again. And on it goes through the first two episodes made available for review in a series built around the deadly implications of medical error. Standing up to Bell -- or at least making a show of doing so -- is cocksure third year resident Conrad Hawkins (Matt Czuchry). He’s a star player who delights in riding herd over newbies, in this case Harvard medical grad Devon Pravesh (Manish Dayal). “All the rules you followed we’ll break,” Pravesh is assured on Day One. So follow his orders or else. Hawkins also is trying to re-land nurse practitioner Nicolette “Nic” Nevin (Emily VanCamp), who’s now playing harder to get than she apparently did the last time around. She’s the one who tells Pravesh that medical error is the No. 3 cause of death, behind only cancer and heart disease. “They don’t want us talking about that,” she adds. In Sunday’s premiere, the patients range from a junk food-loving, plus-sized hillbilly with a gangrenous foot to a young, severely drug-addicted woman. Both carry over into Episode 2, which adds the case of a congressman and hospital benefactor who has a heart attack while hunting with his aging pals, including Dr. Bell. He’ll need a heart transplant, but the needed matching ticker already has been reserved for one of Dr. Hawkins’ pet cases, a 28-year-old African-American school teacher. Bell of course “un-allocates” the heart, prompting a clash of wills between the two headstrong surgeons. “There’s nothing you can do,” Nic first tells Hawkins. “Says who?” he retorts. Groan, I need a sedative. Still, their inevitable chess match over who gets the heart is well-played for the most part. But neither of these combustible MDs is the most interesting doctor in the house. That’s because Dr. Mina Okafor (Shaunette Renee Wilson) instantly registers as the proudly assured surgeon whose mastery of state of the art equipment literally plays into Bell’s unsteady hands. He holds a hammer over her as well, but don’t expect Okafor to play along for long. Episode 2 also drops in Melina Kanakaredes (little seen after co-starring in CSI: NY) as the accomplished but possibly duplicitous Dr. Lane Hunter. Cast after the pilot was filmed, she’ll be a regular in future episodes. The Resident already seems to be straining credulity with the demonic Dr. Bell. How long can he rule with an iron fist as the hospital’s most-requested celebrity surgeon? That hand isn’t getting any steadier while his ego shows no sign of downsizing. But this isn’t supposed to be a soap opera in the mode of Dallas, so Bell seemingly can’t get away with being a broadly drawn J.R. Ewing. Something’s got to give. And I’m interested just enough in The Resident to see if something soon does. FX’s second American Crime Story entry could be far more accurately titled The Dissection of Andrew Cunanan. But in the realm of readily recognizable names, that doesn’t ring many chimes. So it’s The Assassination of Gianni Versace, even though Cunanan is the driving force while two of his other younger victims -- there were five in all -- get fuller treatments than the iconic fashion designer. Former Glee star Darren Criss inhabits Cunanan with more flash and impact than any model who ever wore one of Versace’s creations. He’s alternately chilling, pathetic, conniving and deluded without ever being visibly remorseful. It’s a fully committed, crazily energetic performance that carries this nine-part miniseries through its peaks, valleys and at times disjointed timeline. Assassination of Gianni Versace also is very nice to look at, except when the corpses left behind are not. Ryan Murphy, lately the busiest man in Hollywood, again shows that he’s generally on firmer ground when dramatizing real-life events rather than fictionally concocting them in series such as Nip/Tuck, Scream Queens, Fox’s new 9-1-1 and FX’s ongoing and very uneven American Horror Story anthology series. His first American Crime Story deservedly won a wealth of major awards with its up-close look at the O.J. Simpson trial. The deliciously bombastic Feud: Bette and Joan, likewise for FX, and the HBO movie The Normal Heart, also were almost uniformly critically praised. Murphy’s biggest fictional triumph, Fox’s Glee, notably stayed away from physical gore and succeeded as an empowering high school musical series. Assassination of Gianni Versace, adapted primarily from Maureen Orth’s 1999 book Vulgar Favors, is fact-based but clearly not averse to taking liberties in depicting Cunanan’s “journey” from vainglorious poser to cold-blooded serial killer. Eight of the nine chapters were made available for review. And composition-wise, the storytellers err in waiting all the way until the eighth hour to detail Cunanan’s destructive upbringing at the hands of an abusive, duplicitous father (Jon Jon Briones as Modesto “Pete” Cunanan) and terrified mother (Joanna Adler in the role of Mary Ann Cunanan). The “sissy kid with a sissy mind,” as Pete puts it in a climactic scene, is put on a path to self-destruction but never really toward self-awareness. It all begins on July 15, 1997, with Versace (Edgar Ramirez) waking up to another day in his splendorous Miami Beach mansion. Servants await him. But he also willingly walks the nearby streets, giving off an air of accessibility while also politely declining an autograph request. By the end of the first hour he’s dead and on a slab, his face gruesomely disfigured from a point-blank bullet wound. Versace’s partner of 15 years, Antonio D’Amico (Ricky Martin), is inconsolable. But the deceased’s steely sister, Donatella (Penelope Cruz), dismisses D’Amico with contempt as a leech whose contributions were less than minimal. She’s now determined to protect the Versace company by keeping it privately held. This lays the groundwork for much of what is yet to come. Being gay in the 1990s was still a considerable detriment, business-wise and otherwise. Versace, Cunanan and three of his other victims were all gay, with only the killer unabashedly coming out as a high schooler. The subsequent story of Jeff Trail (Finn Wittrock) is especially poignant. He was proudly a Navy officer until being “found out” and thrown out. Trail’s eventual ill-fated involvement with Cunanan encompasses several episodes, as does the back story of David Madson (Cody Fern). Both ran afoul of Cunanan’s rages after recognizing him as a fraud and “betraying” him. Chapter 4, subtitled “House By the Lake,” telescopes Cunanan and David at the height of the latter’s fear of him. It’s one of the most powerfully chilling hours of television you’ll ever see -- if you have the wherewithal to see it through. Assassination of Gianni Versace includes two other veteran, recognizable actors, Judith Light and Mike Farrell. For an earlier generation they respectively were the stars of Who’s the Boss? and M*A*S*H. In Chapter 3, they’re paired as Chicago’s very prosperous Lee and Marilyn Miglin. She peddles her perfumes on home shopping networks while he’s a developer with designs on constructing the tallest building Chicago has ever seen. But Lee is also a closeted gay man who can’t get enough of Cunanan. They get together again while his wife is on a road trip. “I feel like I’m alive,” he tells Cunanan after they kiss. Well, not for long. Farrell’s performance is first-rate, but Light steals the episode as the all-business Marilyn, particularly after her husband’s mutilated body is found. Although her time on-screen is limited, Cruz makes some strong impressions as the ever-demanding Donatella Versace. But Martin’s characterization of D’Amico is too one-note and largely inconsequential to really register. Ramirez has some solid scenes as Gianni, but doesn’t resonate nearly as strongly as Cunanan’s three other principal victims. The pursuit of Cunanan, who’s already known to authorities before he murders Versace, is barely a subplot of the first eight chapters. Some viewers may become restive in the process. But the to-and-fro timeline serves both the stories of Cunanan and his victims. 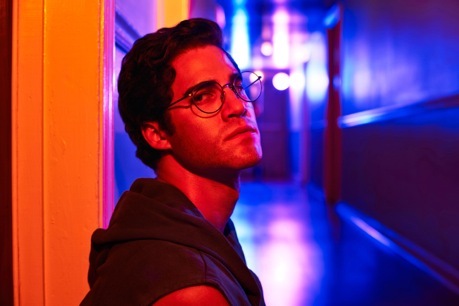 Criss’s performance is a force throughout, but not to the point of “humanizing” Cunanan at the expense of those whose lives he took with varying degrees of glee. The deaths of Jeff Trail and David Madson in particular hurt deeply. This second installment of American Crime Story, which jumped ahead of a planned look at Hurricane Katrina and its aftermath, is unlikely to match the ratings or impact of the O. J. Simpson opener. Andrew Cunanan is a no-name killer in comparison, as are all but one of those whose lives he took so violently. So yes, Gianni Versace’s murder is the overall reason this miniseries came about in the first place. But no, he’s not nearly the half of it. The official network of DC Comics superheroes is adding a fifth. What’s more, Black Lightning strikes a full month before arch rival Marvel can answer with the feature film Black Panther. Both action dramas are groundbreaking in their depictions of an African-American man as the title character. 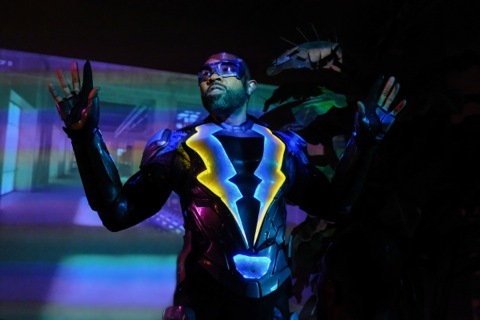 In The CW’s case, it’s Cress Williams in the role of principled high school principal Jefferson Pierce, who nine years ago “retired” without a pension from being Black Lightning after the constant bloody battles he fought ended up costing him his marriage. But hey, how do you just sit back and take it when your two daughters’ lives suddenly are threatened by the marauding 100 Gang? Jefferson also is egged on by longtime friend Peter Gambi (James Remar from Dexter), a tailor/mentor who puts it this way: “Evil’s running rampant like a plague through this city. Hell, through this world.” So get back in costume, will ya? Gambi has even designed a brand new one with a pair of big glowing lightning bolts. Now who wouldn’t want to wear that while dispensing assortments of kicks, punches and electrical jolts? It’s all pulled off powerfully and artfully by principal executive producer Mara Brock Akil (Girlfriends, The Game), who’s assisted by DC impresario Greg Berlanti. The CW’s four other DC ventures, Arrow, The Flash, Supergirl and Legends of Tomorrow, likewise have Berlanti’s name attached. But it’s Brock Akil’s voice resonating throughout, particularly in a slice of daring dialogue from Episode 2. It comes from sinister 100 Gang bossman Tobias Whale (rapper-actor Marvin “Krondon” Jones III) after an underling known as Lala (guest star William Catlett) tells him he really must hate black people. Whale, an African-American with albinism and red hair (as is Jones III in real life), replies in no uncertain terms that he in fact hates “incompetent, thick-lipped, scratch-where-it-don’t-itch Negroes like you. Ya’ll keep us acting like newly freed slaves.” That’s quite a mouthful for a broadcast network drama. Jefferson’s ex-wife Lynn (Christine Adams), whom he still loves, shares custody of their two daughters. The oldest, Anissa (Nafessa Williams), is a “metahuman” like her father, but doesn’t yet have a handle on her powers. She teaches part-time at the city of Freeland’s Garfield High School, where dad’s been principal for the past seven years. Anissa’s personal life provides an additional subplot. Younger sister Jennifer (China Anne McClain) is a Garfield student with a knack for acting out and causing trouble. Her clandestine visit to a dangerous club ends up triggering dad’s halting decision to come out of retirement. His eyes glow when he’s, in a sense, Hulking out. And there’s lately a lot of attendant stuff to Hulk out about, particularly after Jefferson and his daughters are wrongly pulled over by a rather too prototypically abusive white cop in search of a liquor store robber. “Have a good night, sir,” he smirks after humiliating them. Meanwhile, confidante and veteran detective inspector Henderson (Damon Gupton), who’s African-American, keeps urging patience and calm amid the growing mayhem. Henderson’s daughter Keisha (Kyanna Simone Simpson), a budding hellcat, also happens to be impressionable Jennifer’s best friend. So there’s a lot brewing here, and Black Lightning is adept at building the tension leading to Jefferson’s breaking point. “It is time that people know that Black Lightning is back,” he declares. And at this point, hell yeah. Black Lightning isn’t as quippy as some of CW’s other DC offerings. The stakes are more real in nature, with Tobias demonically intent on keeping order his way in a predominantly black domain. This is a series of serious intent while also serving as a breakthrough depiction of a superhero who’s both colorful and of color. Series star Cress Williams, now 47, has been waiting a long time for his first starring role after playing a wide variety of supporting parts in dozens of TV series. He delivers the goods in Black Lightning as a title character of steely intent whose vulnerabilities are also a major part of his makeup. Are his powers a curse or, as he prefers to see them, a “blessing from God?” However things turn out, it’s already quite electrifying. The fine line between being amusingly under-achieving and annoyingly pathetic is criss-crossed repeatedly in Freeform’s Alone Together. Still, these tales of two needy, misfit L.A. millennials aren’t coming from ancient baby-boomers or even condescending Gen Xers. 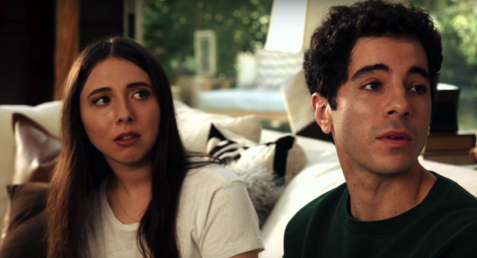 Esther Povitsky, also known as “Little Esther,” and Benji Aflalo, are both still within the 18-to-34-year-old millennial age range. As the co-creators and stars of Alone Together, they have more than a little self-awareness about being adrift, unfulfilled and basically parasitic. Benji sponges off and lives with his prosperous older brother Dean (Chris D’Elia from NBC’s Undateable and Whitney), a self-absorbed real estate broker and serial dater of beautiful women. Esther is along for this ride as Benji’s platonic best friend. They commiserate, kvetch and argue with one another about matters of mostly no import at all. “The two of you were meant to be together -- like O.J. and jail,” says mutual friend Jeff (Edgar Blackmon), who drops in and out of episodes. All three of them are apprentice standup comics, but only Jeff is seen actually applying this trade in these five episodes. Esther’s obsessions with the inconsequential can be laugh out loud funny while also losing some traction as this show goes on. And it will go on. Freeform already has renewed Alone Together for a second season. It all began as a short, self-produced film by Povitsky before bigger fish, namely Andy Samberg’s The Lonely Island production company, took notice and sold Freeform on the idea of a weekly series. Episode 2, subtitled “Fertility,” is one of the better half-hours. Esther is interested in freezing her eggs and finding a worthy match for them. She’s stunned when this happens quickly. “I can’t even get selected for jury duty, and you know how good I am at judging and punishing people,” Esther tells Kevin. Her meeting with the prospective mother (guest star Denise Richards) at first goes swimmingly. But of course this can’t last because Esther and Benji can never succeed for long. A “Road Trip” episode, with Jeff also a prominent player, pretty much runs out of gas after initially showing promise. Episodes 4 and 5 -- “Pop Up” and “Dean’s Girls” -- are better at holding together. They also help Benji to realize his full potential as a malfunctioning, neurotic adult, whether he’s persuaded into buying a fish tank by a pot-smoking entrepreneur with “restless neck syndrome” or selling his older brother on his built-in ineptitude. “Who knows more about being lonely and desperate than me?” Benji reasons. Alone Together otherwise can be pretty good company for the most part. Povitsky in particular is uniquely capable of selling her gibberish with just the right facial expressions and voice inflections. There’d be no hope for the future were every millennial this way. But as voices of a hopefully very small subset of their generation, Povitsky and Aflalo are funny enough in spots to make a go of it as two oddly self-aware non-starters. That didn’t take long. The first potentially great new TV series of 2018 is already upon us. 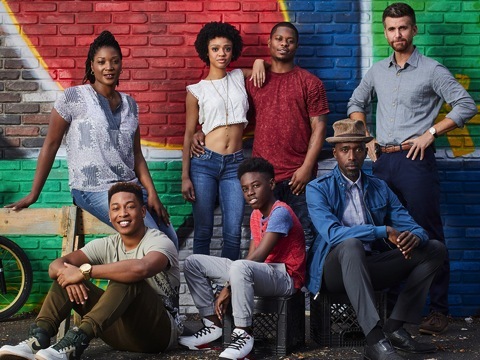 Showtime’s The Chi (Sunday, Jan. 7th at 9 p.m. central) is both a penetrating look at a hard-pressed neighborhood and a tale of two senseless murders. Its principal architect is Lena Waithe, who recently won a writing Emmy for the “Thanksgiving” episode of Netflix’s Master of None. The four episodes made available for review are not without a collection of certain “types.” But with Waithe at the helm, along with show runner Elwood Reid, they don’t come off as stereotypes. The Chi has the basic ingredients of most ensemble drama series -- characters who are mostly good and mostly bad, plus those caught in the middle by circumstances that keep bedeviling them. But how their stories play out is what makes or breaks a series. And The Chi shows strong signs of making its mark without losing its way during what will be a 10-episode Season One. One key character in the premiere episode is fated to be a corpse before the closing credits. The identity won’t be given up here in the interests of allowing viewers to experience the full and eventually reverberating impact. The series’ first victim is never seen among the living. Jason, a star basketball player, is found dead near a “stash house” in a lethal neighborhood. Discovering the body is teenager Coogie (Jahking Guillory), who gets around on a banana seat bike while getting by on guile and charm. He’s brought in for questioning by detective Rick Cruz (Armando Riesco), a good cop whose colleagues can’t always say the same. Jason was the son of vagabond Ronnie (Ntare Guma Mbaho Mwine), a jobless hustler who talks about turning over new leafs but keeps dog-earing the pages. He’s fully intent on finding Jason’s killer, though. Coogie’s half-brother, Brandon (Jason Mitchell), is a talented apprentice chef who dreams of opening his own place. He lives with girlfriend Jerrika (Tiffany Boone), a successful realtor. They’re The Chi’s case study in stability until events begin bleeding in. There’s also Emmett (Jacob Latimore), a handsome playa and initially reluctant father whose no-nonsense mother, Jada (Yolonda Ross), tends to the stay-at-home sickly. Her patients include Ronnie’s very cantankerous grandma, Ethel (a scene-stealing performance by La Donna Tittle). Her tough love is of almost epic proportions. Meanwhile, at Hopkins Prep, pals Kevin, Papa and Jake (Alex Hibbert, Shamon Brown, Michael Epps), have their foul-mouthed vocabularies down pat but remain relative innocents in their tough nut of a neighborhood. Seeing them interact is one of The Chi’s considerable charms -- even with f-bombs often attached. Lurking about is Quentin (Steven Williams), who’s older, wiser and accustomed to having people owe him. Williams exudes an almost courtly menace in a role that gains traction in Episode 4. Whether young, old or in-between, all of these characters resonate in their own distinct ways as The Chi builds both momentum and suspense. This is no small achievement for Waithe, whose first TV series under her direct control is bursting with flavor and humanity in a South Chicago proving ground. The footing is always slippery, but the storytelling remains bracingly sure-footed. Greatness beckons after the first four episodes. And so far there’s no reason to think that The Chi will fall short of achieving it. Whatever the depth of your fandom or ignorance, the ABCs of The X-Files generally are the equivalent of seven Scrabble letters. They seldom add up to a whole. Not that Fox is even remotely concerned. 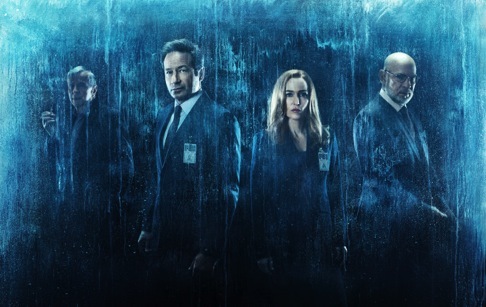 Who cares if the truth is out there when David Duchovny and Gillian Anderson are back in full view as the network’s most famous fictional drama duo? Fox Mulder (Duchovny) and Dana Scully (Anderson) were instrumental in putting Fox on the map during its formative years as a rival to ABC, CBS and NBC. Nearly a quarter-century later, here comes a second reboot (of 10 episodes) after Fox coaxed Anderson and Duchovny into doing a six-hour return two Januarys ago. The reset starts on Wednesday, Jan. 3rd at 7 p.m. (central). Things since have changed rather dramatically on the veritas front. And although he’s never named specifically, a stand-alone Episode 4 (subtitled “The Lost Art of Forehead Sweat”) leaves no doubt that Donald Trump is its drink-stirrer. “What was he referring to?” Mulder wonders. “What does it matter?” Dr. They says as a parting shot. Translated, The X-Files’ unfolding and ever convoluted “mythology” is also now free to run even wilder. After all, we’ve just lived through a year of “alternative facts” and “realities” that literally have served to trump the nation’s lie detectors. True believers who have devoured most if not all of the 208 previous episodes likely will find it thrilling simply to be strung along anew. Those of us who have been less dedicated to the cause perhaps can be more forgiving of the show’s loopy transgressions. To be sure, The X-Files isn’t any more plausible. But within its particular realm -- and in these particular times -- it can strain credulity with an abandon that might not cause as many eyes to roll out of their sockets. Besides Mulder and Scully, two X-Files mainstays also return to the mix. Assistant FBI director Walter Skinner (Mitch Pileggi) continues to play both sides while “Cigarette Smoking Man” (William B. Davis) remains a fount of revelations. At the close of Episode 1 (one of five made available for review), he unspools a biggie while in the company of Skinner. Not that he can be trusted. As this point in its long run, The X-Files probably doesn’t need to fully sort itself out in any real shape or form. Will Scully and Mulder ever be reunited with their long-lost son? Or is he even the father? And by the way, who is Mulder’s real pops? Riddle me “Project Crossroads” -- and who’s all in on it. Furthermore, do you know the way to San Jose? Whatever emerges, Duchovny and Anderson appear to be fully invested in these iconic roles. Both once ran away from the idea of being wedded to Mulder and Scully. But over time, being paid very handsomely has a way of breaking down one’s resistances. Money talks. That’s one truth that’s very much still out there as we head into an otherwise topsy turvy 2018.